DUBAI, United Arab Emirates (AP) — Iran arrested more than 7,000 people last year, including dozens of journalists, in what Amnesty International on Thursday called a “shameless campaign of repression” as the U.S. released an American anchorwoman for Iranian state television held for days as a material witness. While Iranian officials and state media have widely condemned the arrest of Marzieh Hashemi of the broadcaster’s English-language channel Press TV, the figures released by Amnesty highlight the widespread campaign of arrest and harassment those in the media face in the Islamic Republic. Even as Hashemi was released, Iran sentenced prominent whistleblower journalist Yashar Soltani to five years in prison after his series of exposes alleging massive corruption in land deals linked to Tehran’s former mayor. Meanwhile, Iranian state TV continues to face criticism for airing statements from detainees made under duress, including two recent ones from labor activists Esmail Bakhshi and Sepideh Gholian who allegedly faced torture. Authorities detained both of them again this week. The Amnesty report said that among those arrested in 2018 were protesters, students, journalists, environmental activists, workers and human rights defenders. Some 50 detainees were media workers, of whom at least 20 “were sentenced to harsh prison or flogging sentences after unfair trials,” the report said. Last year began with nationwide protests that started over Iran’s deteriorating economy and soon grew into anti-government demonstrations. Iran is in the grip of a financial crisis and has seen sporadic protests in recent months as officials try to downplay the effects of the newly restored U.S. sanctions on Tehran. 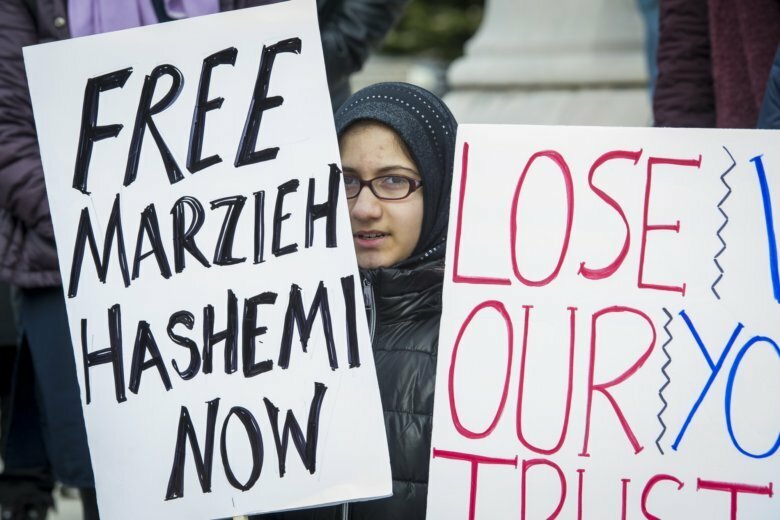 In Hashemi’s case, she was detained by U.S. federal agents on Jan. 13. She appeared at least twice before a U.S. federal judge in Washington, and court papers said she would be released immediately after her testimony before a grand jury. Court documents did not include details on the criminal case in which she was named a witness. Hashemi sent a message to supporters on Thursday after her release. “I have a lot of things to say about what I have suffered,” she said in Farsi. Later on Thursday, Iran’s judiciary chief Ayatollah Sedegh Amoli said a “massive release” of prisoners is expected on the 40th anniversary of Iran’s Islamic Revolution next month, according to the judiciary’s official website. Official reports say there are more than 240,000 prisoners in Iran.